Start your outfit with a simple black turtleneck as a base. Layer a medium-wash denim jacket over your turtleneck. Jessica's leopard print coat was a vintage find, but you can easily recreate her look at the mall. The key is to keep the coat length long, so it doesn't look bulky layered over a sweater and denim jacket. Make sure your skinny jeans are a significantly darker wash than your denim jacket. Otherwise, you'll be wearing a denim suit! Not cute. A geometric shape adds some edge to Jessica's office look. A low wedge adds height to balance out all your top layers. Jessica's satchel is roomy enough to carry everything but the kitchen sink, but this smaller yet similar style is just big enough for all your essentials. Cat-eye shades are the shape of the season. Stick with all black to complement your leopard print jacket. 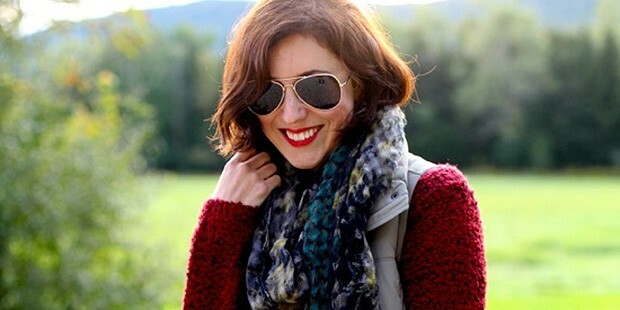 Jessica Quirk of What I Wore really knows how to layer. Here, we've dissected her cute winter office look so you can pull it off too.